With so many watermelons fresh from the farms around, here's a perfect summer special slush to kill the heat that will be ready in minutes. Slightly crush the watermelon in the grinder. Add the sugar if the melons aren't very sweet. Add the mint leaves and lemon juice and give a final run. To add a little fancy to your serving glass. Wet the rim and dip it in sugar. Serve the slush cold with or without ice. Drumsticks must be quite a favorite for many of us and we have a hundred new ways of making those tender green pods. But to our surprise when we were picking these dark greeny drumstick leaves which is a rare find in our Indian grocers, lots of them asked us about what we'd do with them and how we'd cook them. That's when we realized its popular only down south, specially in Kerala where most homes have plenty of drumstick trees growing in the backyards and the pods, the flowers and the leaves have a culinary usage. These drumstick leaves are full of all the good vitamins and iron and can be made this way or can be added into any dal for an interesting change. Also remember that these leaves are slightly bitter, pretty close to the taste of methi leaves. Heat some oil in a pan. Splutter the mustard seeds, urad dal and the dried red chillies. Add the raw rice and curry leaves. Roughly crush the garlic pod, ginger and pearl onions using a mortar and pestle. Add this to the pan and nicely saute. Add a pinch of turmeric powder. Now add the drum stick leaves and saute well. Toss everything until it gets mixed well. Cover the pan for about 5 mins . The drumstick leaves turn color to a dark green. Add coconut and toss once again. Adjust the salt. The thoran is ready to be served with hot rice. The festival of Vishu is celebrated on the first day of the Malayalam month "Medam" which marks the beginning of a new year. On Vishu eve, the lady of the house with all the care decorates and arranges the things in the pooja room for the Kani. Kani items include golden lamps, fresh linen (kasavu), a measure of rice or paddy, gold ornaments, silver, money, coconuts, jack fruit, mangoes, yellow cucumbers, flowers of the Konna tree (Cussia fistula), mirror and a garlanded deity of Lord Krishna. The dominance of yellow and gold in the kani signifies prosperity. At early dawn, the eldest member of the family lights all the lamps and takes each of the family members blindfolded to the pooja room to see the auspicious "Vishukani" which literally means the first sight. Vishukani is a splendid treats to your eyes and mind, a tradition that is kept with a belief that seeing good things will bring happiness through each day of the year. Being the new year everyone wears new clothes and gets ready for the next ritual "Kaineetam". Kaineetam is a symbolic act of sharing prosperity where the elders of the family give money to all the younger ones. And no Kerala festival is complete without the elaborate delicious sadhya which is a grand array of sweet, tangy and spicy dishes eaten traditionally on the banana leaf. 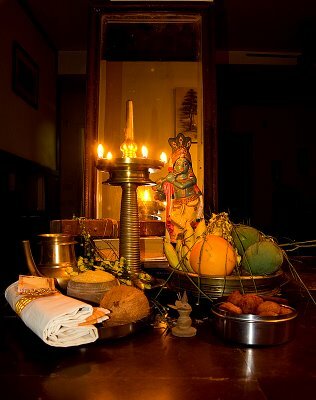 So here's wishing all our dear readers a very blessed ,happy and prosperous Vishu. May each day ahead bring you a thousand more reasons for happiness. Here's our first time attempt at the classic Banana Chips which originates from Kerala. Considering all the plantains that surrounds its gorgeous landscape, the foodies in our earlier generations had to come up with this super delicious crunchy snack. Peal the skin of the raw plantain. Soak this in water with a teaspoon of turmeric for about 15 mins. Heat some oil to deep fry. Dissolve the salt in water and keep it aside. Pat dry the plantain and finely slice them into thin round pieces. Once the oil is smoky hot, slide each of the banana pieces into it. Turn them over to evenly cooked. Once its 3/4 done (becomes golden yellow) pour 1 teaspoon of the salt water into them. You need to be extremely careful while you do this. The oil starts to splash with a loud hissing noise. Hold a lid to cover these oil bursts away from your face. This process actually lets the water evaporate and thus the salt sticks onto the chips. Once the noise slowly fades, drain out the chips from the oil and let them cool. Make sure you keep decreasing the saltwater each time while frying next batches of chips as the oil contains salt from the previous time. Store them airtight and they will last for a week easily. Jackfruit with its distinct sweet flavor adds a vibrant tweak to any payasam/kheer and specially the pradhaman which is a rich syrup made with jaggery and coconut milk. And this seems like the perfect one to finish the elaborate Kerala Sadhya on a sweet note. * Since we didn't get fresh jack fruit here in Seattle, we had to make-do with the canned version of the fruit you get in Asian stores. Pressure cook these fleshy pieces or steam them until they are soft and cooked. Grind it in the mixer until smooth. Heat some ghee in a deep dish, add this ground jackfruit to it and keep stirring for about 15 mins. The ghee starts to come out on the sides. Meanwhile melt the jaggery until you get a nice brown syrup. Pour this melted jaggery to the jackfruit mixture and mix thoroughly. Now add the coconut milk diluted with very little water and let it come to nice boil. Fry the coconut cuts, raisins, cashew pieces in ghee and pour it into this. Chakka pradhaman is ready to serve hot or cold anyway you like it. As we are getting ready for Vishu which marks the beginning of a new year in Kerala, we are adding some more recipes to our sadya collection. Though bitter gourd is not a friendly dish to many palettes, this recipe is definitely worth trying. We also have another variation made with okra/vendakka. Finely chop the bitter gourd and green chillies. Heat enough oil to deep fry the chopped bitter gourd along with the chillies. When its almost brown take it off from the oil and keep aside. Grind grated coconut, ginger and mustard seeds to a fine paste. Mix the curd to this paste. Give one final run in the mixer if you want. Add the fried bitter gourd to this and nicely mix. For seasoning heat some oil, splutter mustard seeds, curry leaves and dried red chillies. Add the seasoning to the curd mix and keep it on low heat for exactly 2 minutes.